Thumbs Up or Down: 32 oz Sports Water Bottle with Fruit Infuser. Locking Flip Top Lid and Carrying Handle. 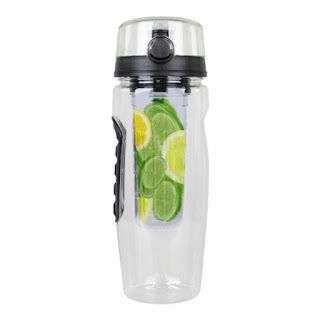 32 oz Sports Water Bottle with Fruit Infuser. Locking Flip Top Lid and Carrying Handle. I love this water infuser water bottle. It is larger than other fruit infusers that I have used in the past. It is 32 oz! This has rubber finger gripper on the side making it way easier to handle and also prevents it from slipping out of your hand. It has a locking feature on the lid to prevent any spills. I put frozen and fresh fruit inside. I have dropped mine a few times and it has never spilled and has never broken. It fits perfect in my car on on my treadmill. I have been drinking a lot more water since I got this. My favorite is cucumber, mint, blueberries. It is super easy to clean. 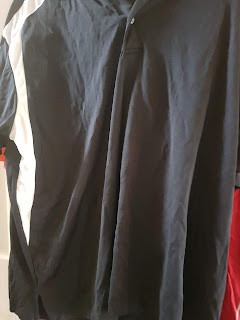 You can put in dishwasher, but I just use warm water and soap and comes out like new. I received this product for my honest and unbiased opinion.